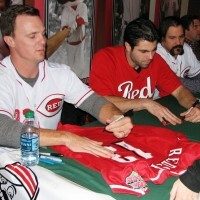 Jay Bruce signs the jersey of a Reds Heads kids club member. Yes, the Cincinnati Reds lost an excellent pitchers’ duel between Bronson Arroyo and Jaime Garcia last night, but you undoubtedly stayed up to watch that whole thing. 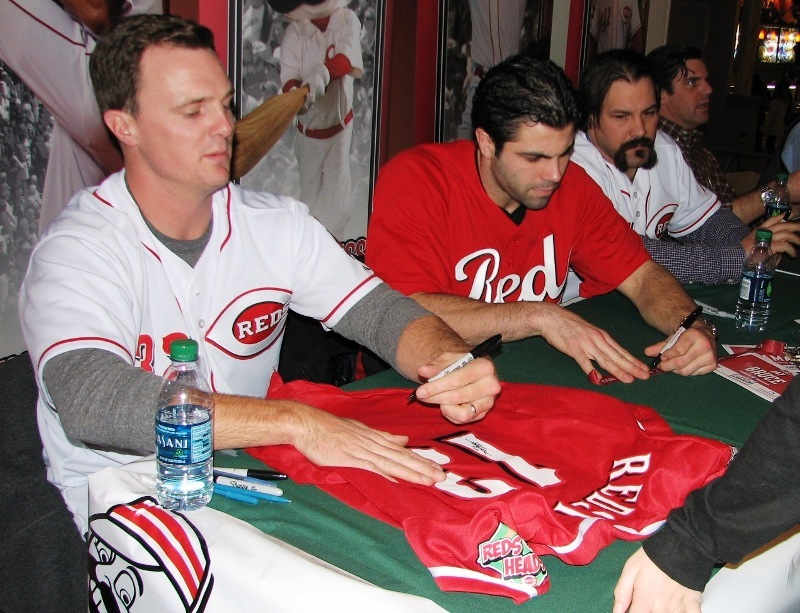 What you may have missed was Jay Bruce reaching his limit of twitter abuse around midnight after the game. Bruce has started the season slowly and has yet to go on one of his signature player of the week tears. Not to mention he ended the game last night by striking out. But lashing out on social media? The Enquirer does a great job rounding up the response. I think Enquirer reporter John Fay has the best response. My advice when I saw Bruce looking at Twitter: “You don’t want to do that.” It[‘s] not [a] pleasant place for a struggling athlete to be. That’s very true. I can’t imagine the grief he must receive on a daily basis. People on the internet are assholes. Sports fans on the internet are even worse, as the twitter account showcasing the self-proclaimed best fans in baseball of the Cardinals has shown. I can’t see much good coming from Bruce’s outburst. The more knowledgeable fans already realize that one month doesn’t equal a whole season. The sky-is-falling set will just brush it off as another entitled, rich athlete making excuses for not performing up to his paycheck. With more and more athletes engaging in social media from a younger age, this type of thing is something I can see happening more often in the future. And the only real solution to it is for the player to not engage with his fans and cancel his social media accounts. That would be a shame, considering some of the entertainment and goodwill that’s come from them, such as from Brandon Phillips’. At the end of the day, though, I’d much rather Bruce be focusing on improving his baseball-playing ability than paying attention to idiot criticism. If the trade-off is fewer athlete twitter accounts, that’s something I can live with.